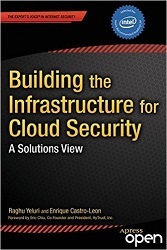 The book highlights the fundamental technology components necessary to build and enable trusted clouds. Here also is an explanation of the security and compliance challenges organizations face as they migrate mission-critical applications to the cloud, and how trusted clouds, that have their integrity rooted in hardware, can address these challenges. Raghu Yeluri is a Principal Engineer and lead Security Solutions Architect in the Data Center & Cloud Products Group at Intel Corporation with focus on virtualization and cloud security usages, solution architectures and technology initiatives.